A powerful database system needs a powerful tool to handle it. PostgreSQL is a robust, scalable and powerful RDBMS. It has been widely used by millions of users, companies/enterprises. Today, I am not going to discuss PostgreSQL itself. I just want to share my experiences and review of EMS SQL Manager for PostgreSQL. The new version of EMS SQL Manager for PostgreSQL 5.9.3 is now available. EMS provides many great database tools for Windows users. You may read my previous review of EMS SQL Manager for SQL Server. What is EMS SQL Manager for PostgreSQL? EMS SQL Manager for PostgreSQL is a special software designed for PostgreSQL administrator. It helps you to manage your PostgreSQL server, database administration as well as developing your database. It supports a wide range of PostgreSQL version. No matter which version you are running, this EMS software is there for you. This is my first time of using this software. EMS SQL Manager for PostgreSQL full version comes with a complete set of features. I was impressed with the backup and restore database features. It saves me a lot of time when it comes to the database backup. EMS SQL Manager provides a wizard-based database backup and restore. Managing multiple databases on multiple hosts? No problem. The seamless, easy to use database registration system on the EMS SQL Manager for PostgreSQL full version is very helpful. You can use SSH as well as HTTP tunneling feature. The user manager feature also very helpful. I can easily create, modify and also delete users. Personally, I am not a fan of the command line. Even I use it sometimes but I would prefer the graphical way when it comes to database management. EMS SQL Manager provides an easy way to create database, tables, modify them as easy as few clicks. 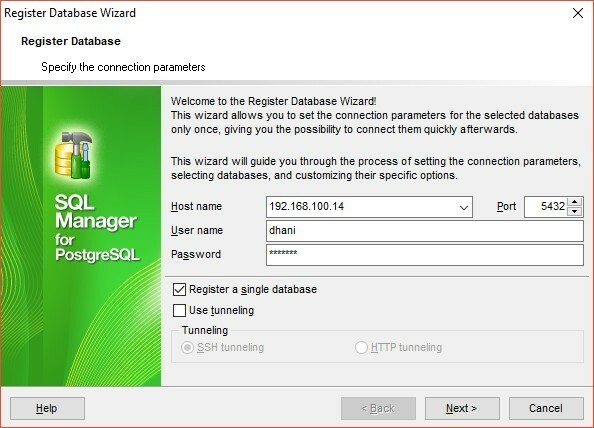 The wizard-based database creation is helpful to quickly create and register new databases. Create a new query, no matter simple or complex ones made easier with EMS built-in query builder. The drag and drop feature lets us design a complex query in a few clicks. EMS SQL Manager for PostgreSQL full version is not free. It’s not a cheap software as well. But, if you are a serious database manager/administrator that needs a powerful tool to manage multiple PostgreSQL instance, then this software is worth the money. A single license key of this EMS for PostgreSQL cost $280. For more complete options, please visit the official page.